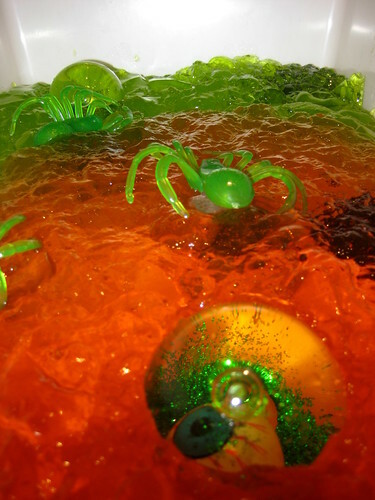 A super fun idea for Halloween messy play – how to make a jello sensory tub! 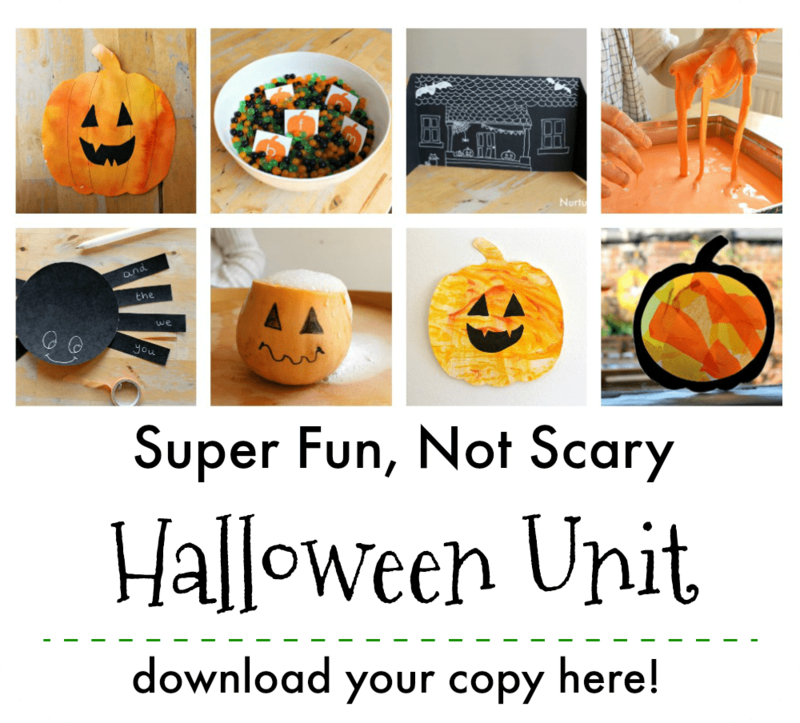 Make your Halloween fun and easy with the Super Fun, Not Scary Halloween Unit. A complete unit of Halloween resources including math, science, literacy, play, art, craft, and sensory, with lots of bonus printables. No monsters, vampires, zombies, ghosts or mummies - just lots of Halloween fun and learning! Halloween has many traditions – jack-o’-lanterns, trick or treating, dressing up in scary costumes – but in our house it’s the jelly messy play which is the one which is most looked forward to by the children. In previous years we’ve had jelly lucky dip inside a pumpkin and in a cauldron, which the kids squish through (if they dare!) to grab sweets which are hidden at the bottom. 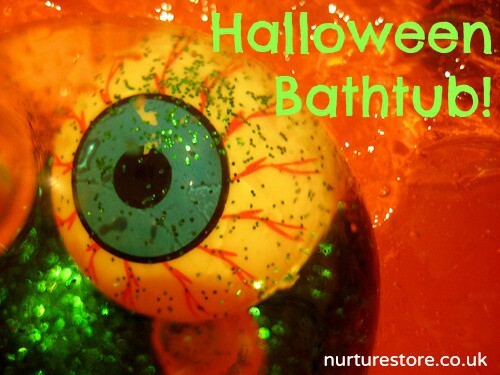 This year we are going with a sensory tub full of green and orange jelly with some ghoulish treasures to discover and scoop out. :: To contain the mess you might consider taking your jelly play into the bath tub. Play with the plug in, scoop out the jelly when you’ve finished and give the tub a good scrub. The tub can get slippy so we have ‘bums on the bathtub’ rule and the kids have to sit down to play. This really looks like messy fun! Oh this looks wonderful, I mean ghoulish! Love the tips you shared. I realized last week that I had *never* yet made Jello (just can’t stop thinking jelly is for spreading on toast in my American brain) with my kids. So, of course, we made some. Leland put a bite in his mouth and said, “Oh I like this! You now it has a feeling in your teeth? I’m feeling it with my teeth!” James on the other hand wasn’t too impressed with the texture. He’d be more apt to play with it the way you all did. Looks like fun! How wonderfully messy! Wish I’d thought of it. I love the eye “balls”. That sounds like so much fun. I actually think I’d like to play with it myself! Oh brilliant, love these tips; there’s a few that I wish I’d known about a week ago before I started doing this! Thanks so much for linking up to ShowOff ShowCase! I haven’t tried jelly yet…it will be added to my to do list! oooh, that is a great idea! Amazing photos too. oooh I love this! I just spotted you on Steve Spangler, but notice I commented last year too!